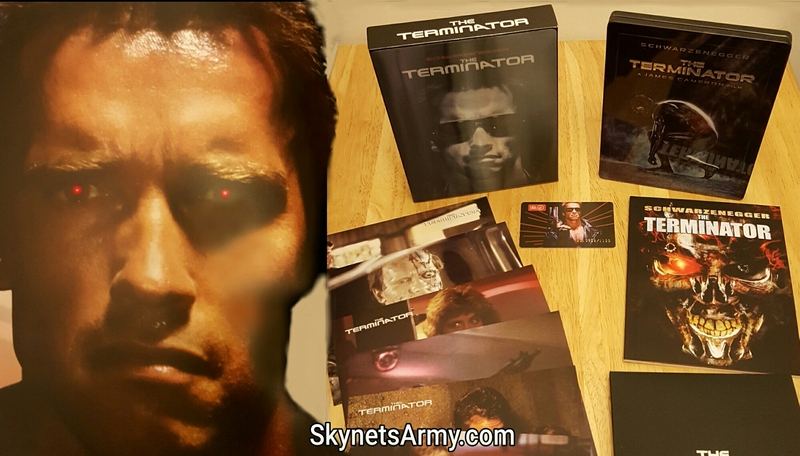 Unboxing & Review of “THE TERMINATOR” HDzeta Gold Label Blu-Ray Steelbook Lenticular Edition! 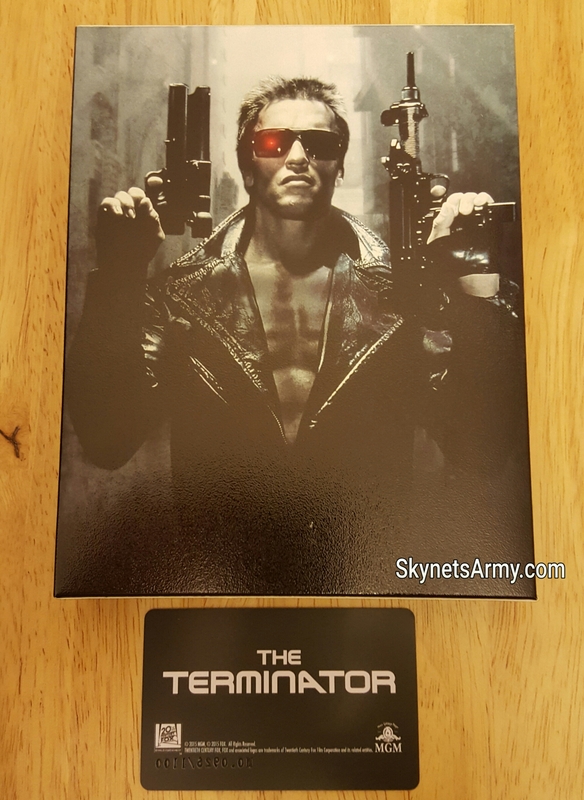 Anyone who collects blu-ray steelbooks knows that the Chinese based company HDzeta manufacturers some of the best steelbooks around. 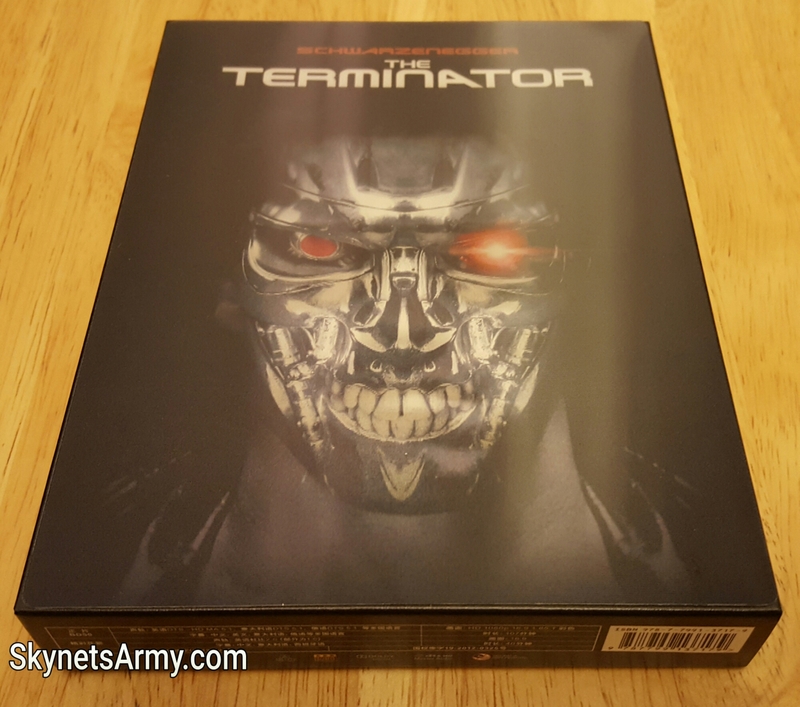 So when HDzeta released a Limited Lenticular Edition Blu-Ray Gold Label Steelbook for the 1984 science fiction classic “The Terminator” earlier this year, we knew we had to share it! So without further ado, let’s take the shrink wrap off and have a look at this beauty! Check out this slip case! 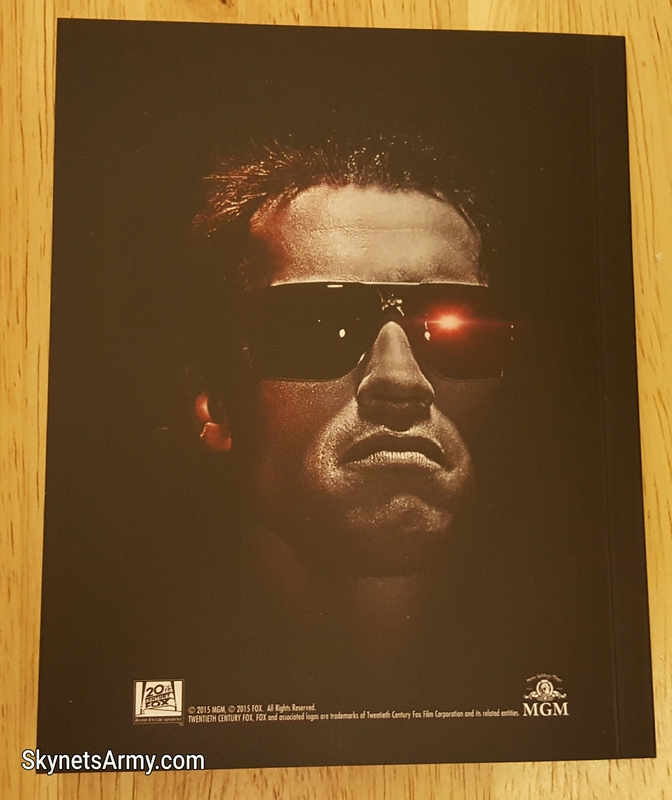 Everyone loves the iconic look of actor Arnold Schwarzenegger wearing those vintage Terminator “Gargoyles” sunglasses. But wait, this slip case is more than it seems! The image on this sleeve happens to be Lenticular artwork, which provides an illusion of depth with the ability to change or move! 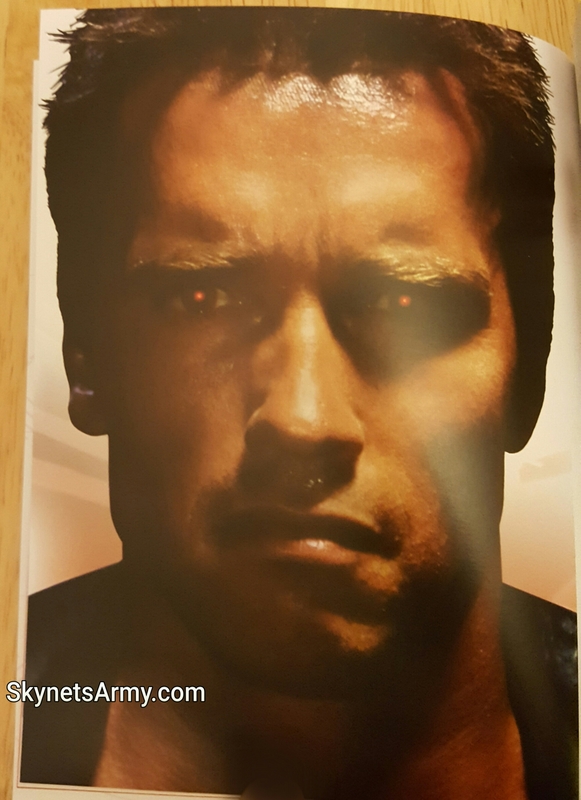 So when you view this iconic shot of Arnold from a different angle, it reveals the T-800 Endoskull that is hidden beneath! And here is a look at the top of slip case. Now let’s flip the slip case over and check out the artwork on the back. 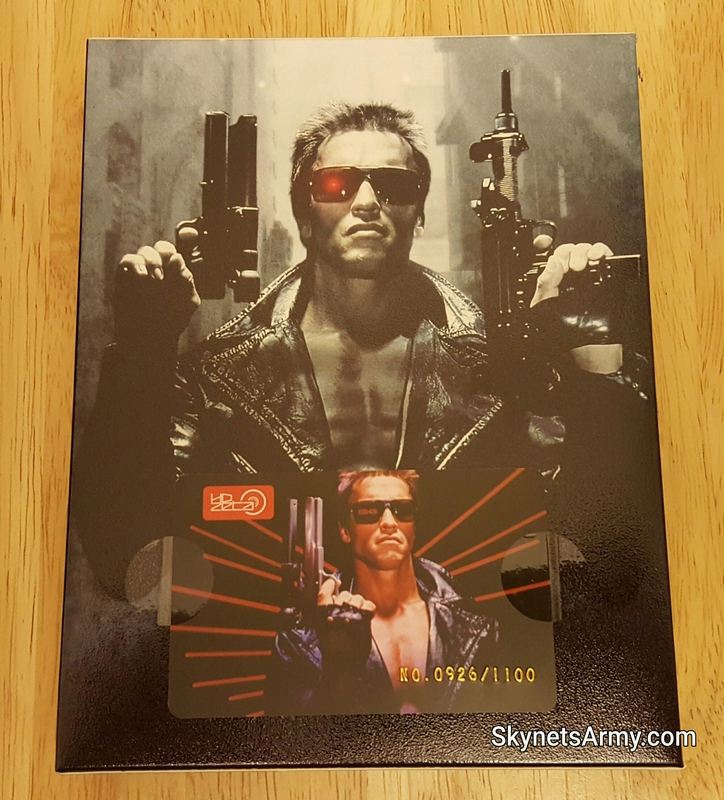 On the back, attached by two clear circular stickers you’ll find a plastic card, showing the precise number you own in this limited edition run. With only 1,100 copies made, this particular copy is #926. Now let’s carefully remove the card and flip it over. It’s time to see what’s in the slipcase. There are two items inside the lenticular sleeve. 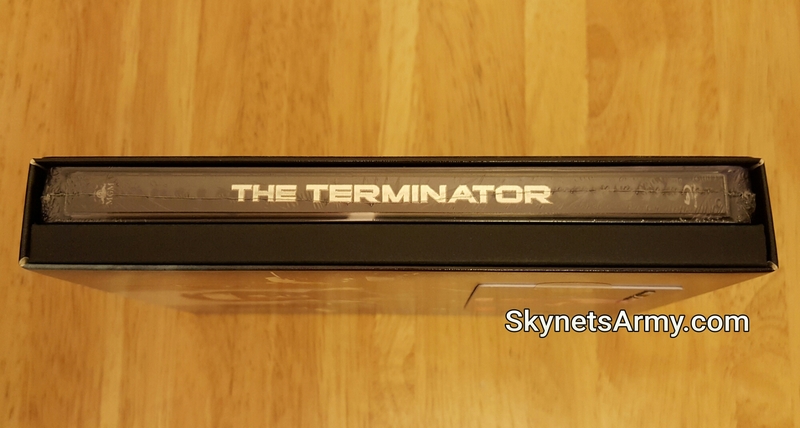 One is the shrink-wrap sealed steelbook and the other is a thick black folder. Without knowing any better, considering there is nothing written on the black folder’s spine, one might think that folder is just carboard filler and mistakenly never pull it out of the slip case. That would be a big mistake. 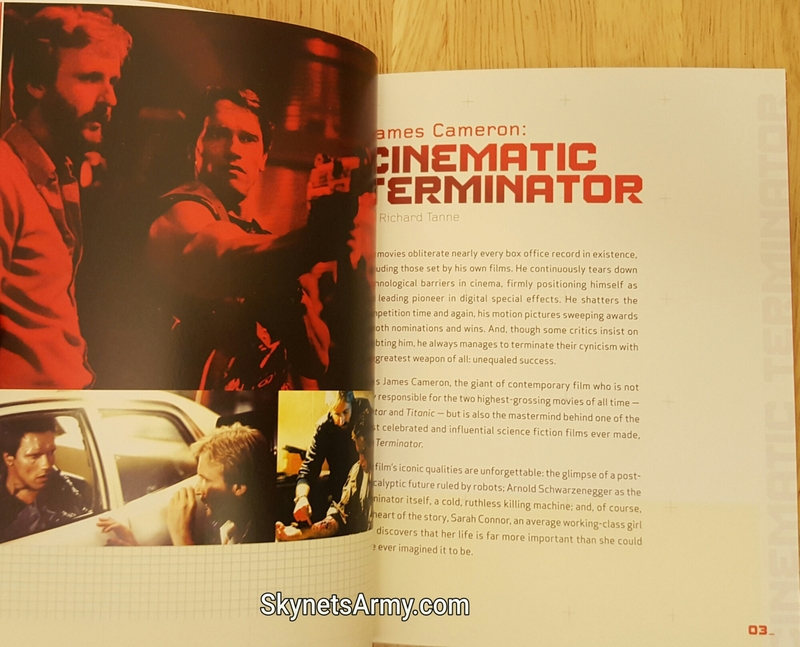 With the sealed steelbook and folder out of its slipcase, our closer look will begin with the folder. The front of the folder is nothing fancy. 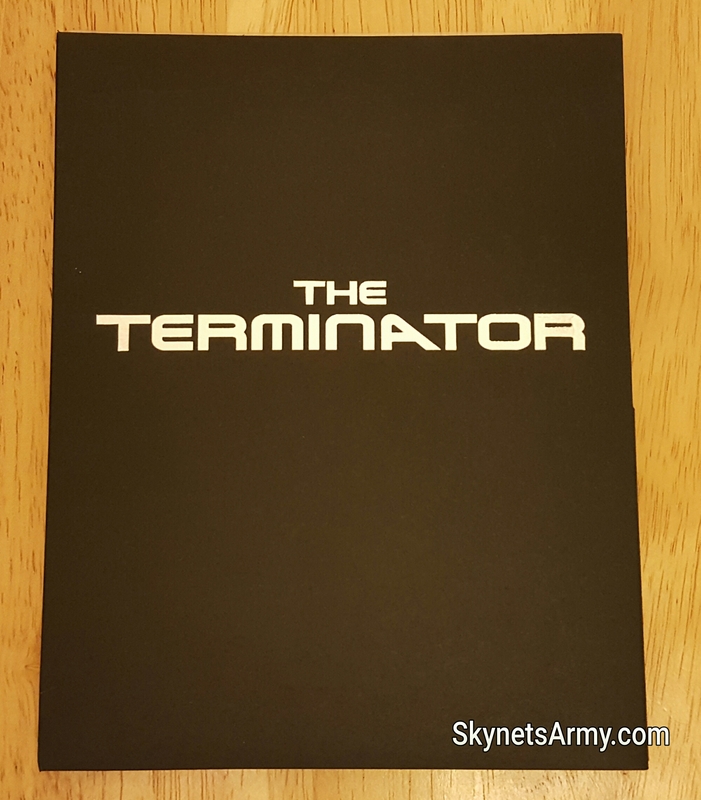 “The Terminator” logo is nice but otherwise it’s just thin black cardboard and all together forgettable. Let’s open this folder up and have a look at its contents. Inside the black folder we find a package of postcards to the left, and a book on the right. Let’s first take a closer look at those postcards. 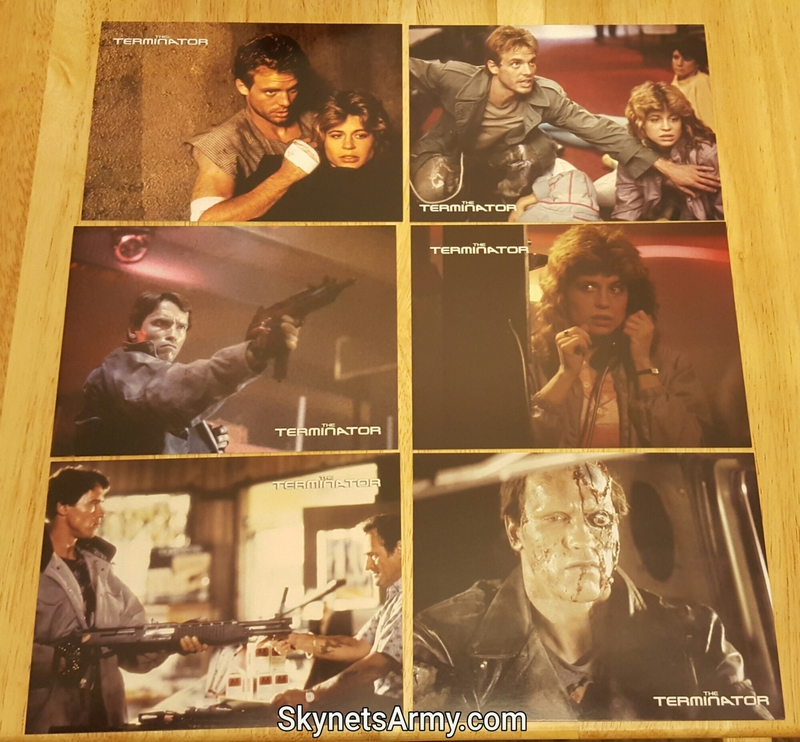 The package reveals six large collectible postcards inside, detailing various iconic moments from “The Terminator”. Now it is time to examine the book. 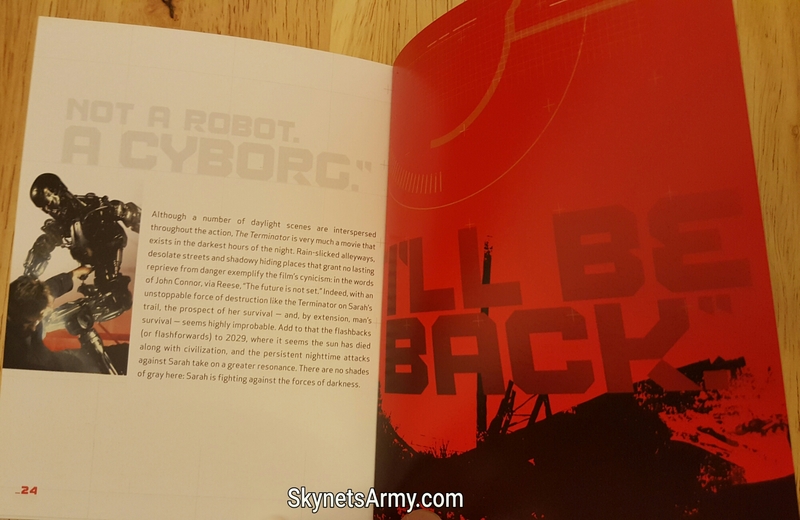 And here’s a look at the back of the book. 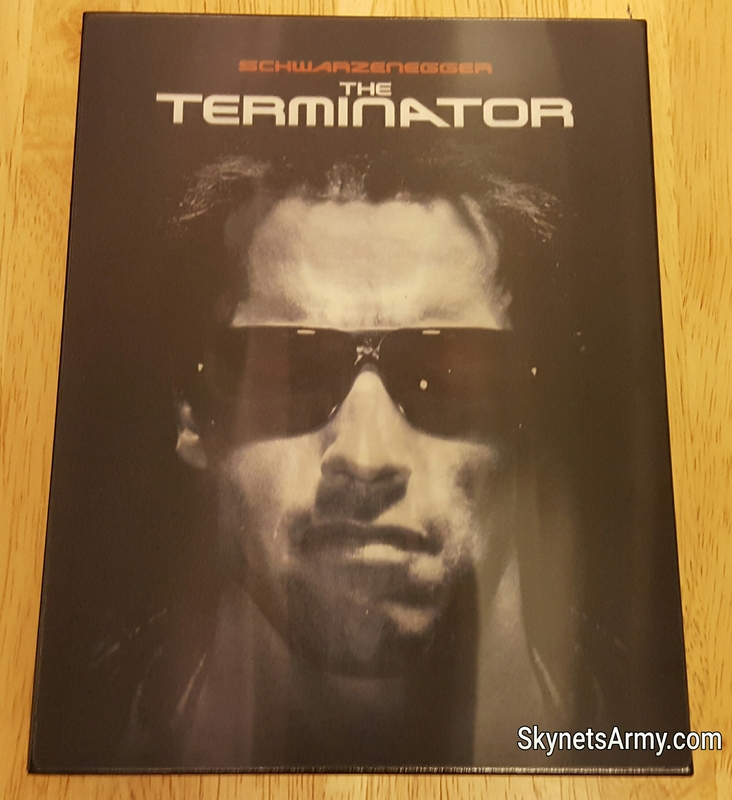 Finally, it’s time to unwrap the steelbook. 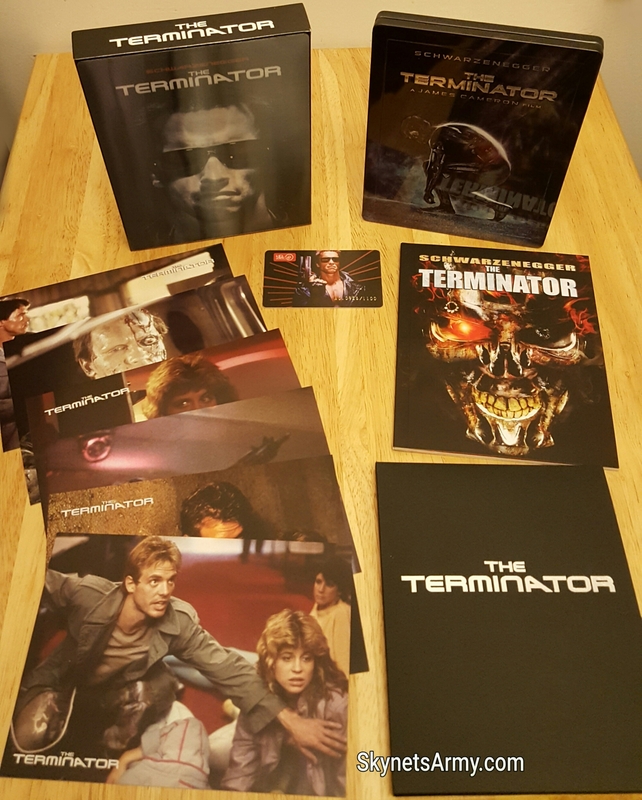 This steelbook is simply gorgeous! It depicts the T-800 Model 101 rising from his time-travelling crouch, revealing hints of the endoskeleton that resides beneath his flesh! 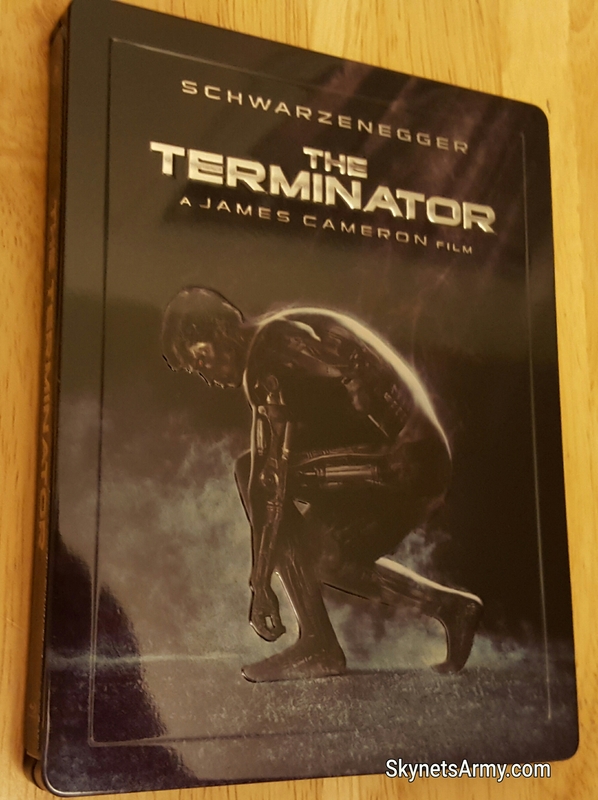 Now both the lettering and the Terminator itself is embossed on the steelbook, giving it a brilliant 3D effect! 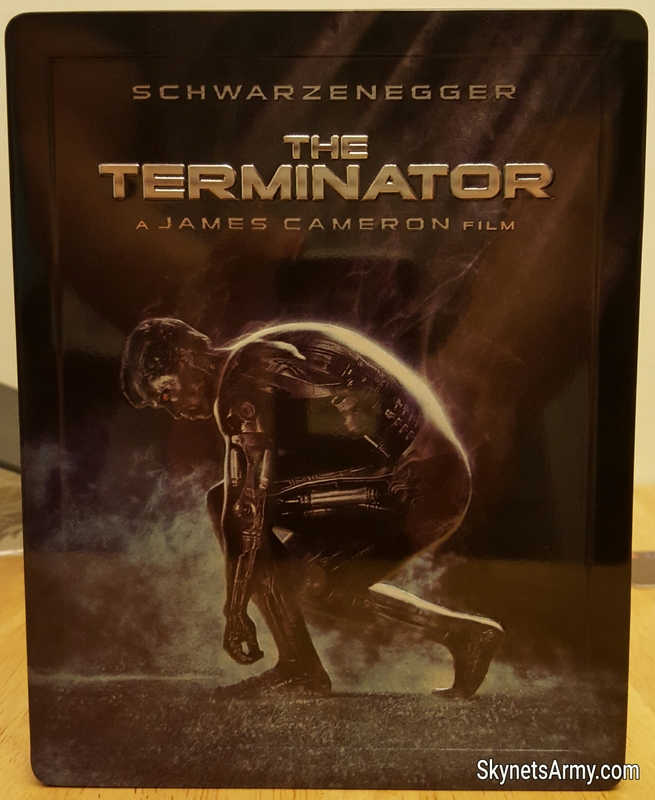 Look at this steelbook’s gorgeous shine! Now let’s flip it over and check out the back. 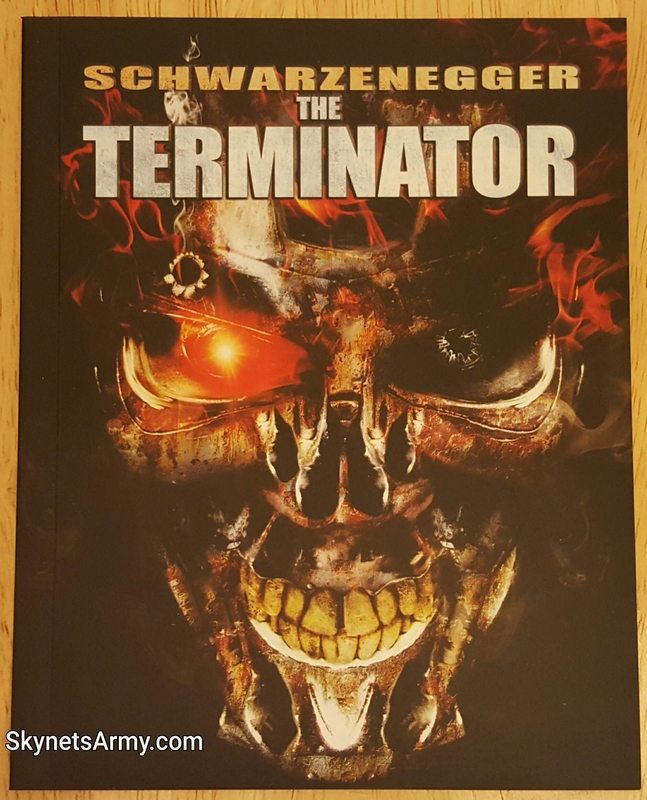 The artwork used on the back of the steelbook is excellent and the red Terminator eye really glows when held at the right angle. 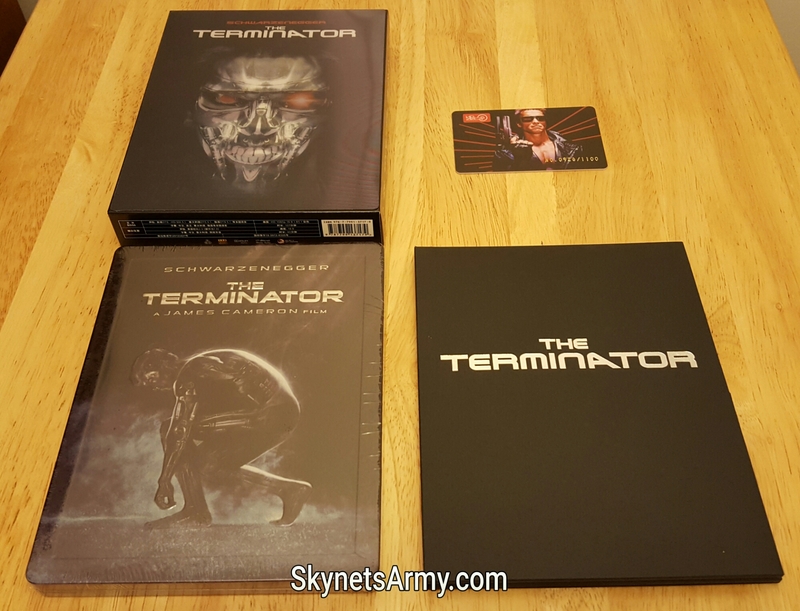 It’s time to open the steelbook and look at the art and single blu-ray disc inside. The blu-ray disc is advertised as region-free which means it can play on anyone’s blu-ray player regardless of what country you live in. 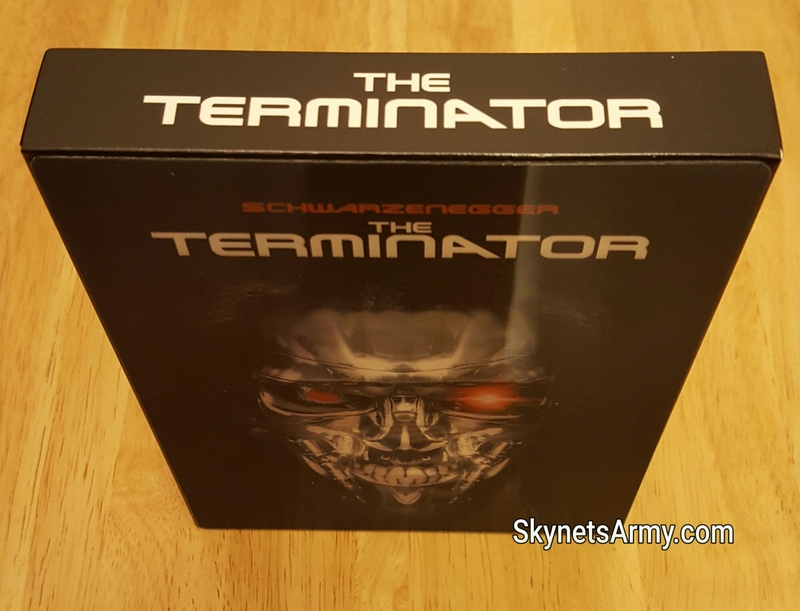 The additional contents on the disc are your standard fare, that can be found on any Terminator blu-ray (which all pale in comparison to the special features made available on a DVD special edition released many years ago). Clearly what makes this set special are the items beyond what is found on the disc. So that’s it! 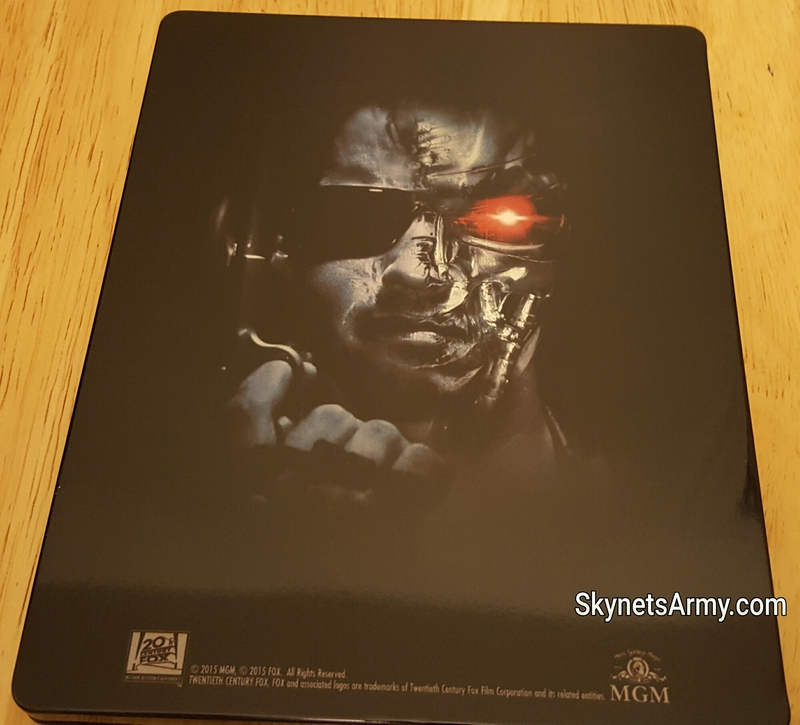 We found HDzeta’s “The Terminator” Limited Lenticular Edition Blu-Ray Gold Label Steelbook to be a solid collectible, with the book and steelbook being the highpoints. 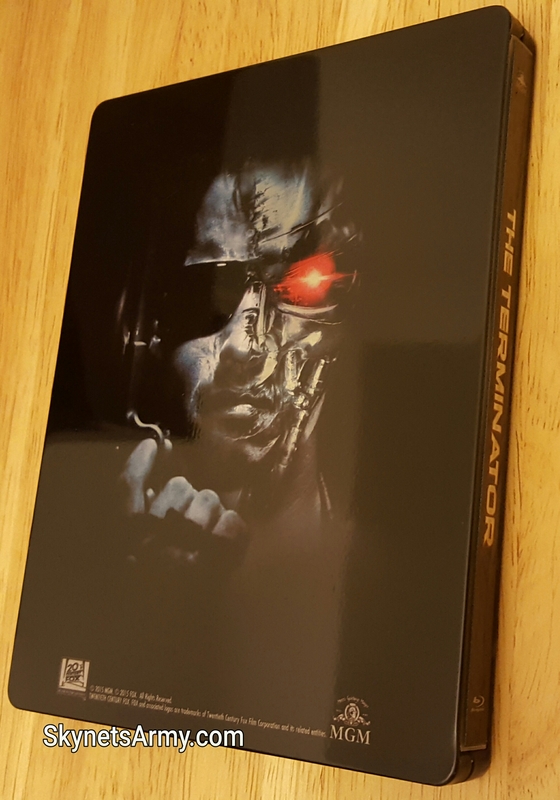 And if you love steelbooks, this metal beauty is one of the sharpest steelbooks we have seen to date and well worth the buy. We hope you enjoyed this unboxing and review. We’ll be back! 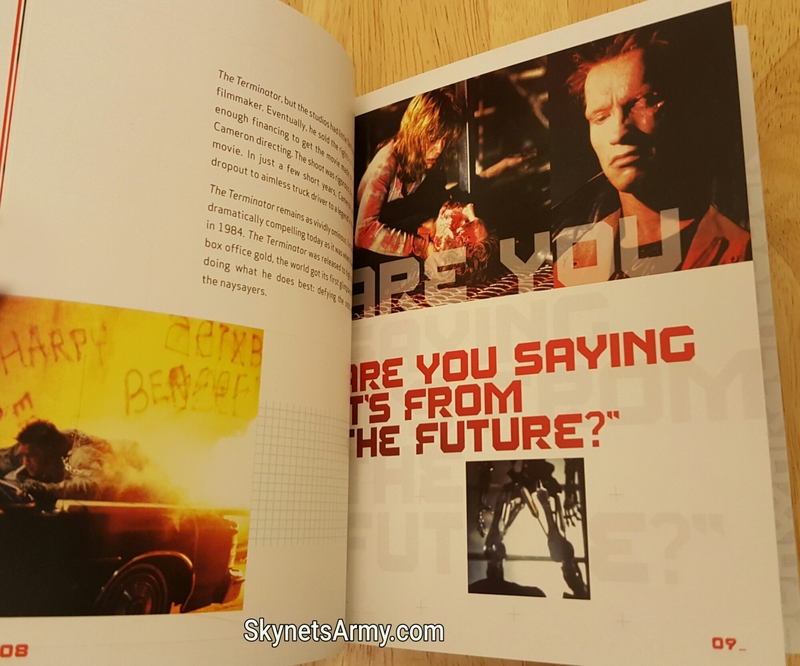 Previous PostTERMINATOR TRIVIA Volume 7: Cool Facts you may not know about the Terminator Franchise!Next PostWhat ever happened to Skydance’s New TERMINATOR Television Series?